There are American Bar Association Model Rules of Professional Conduct and each state has some form of model rules as well. The Bluebook covers citation of model rules in rule 12. The 20th edition of the Bluebook extensively revised rules 12.9.4 and 12.9.5. Rule 12.9.4 covers citation of Model Codes, Principles, Restatements, Standards, Sentencing Guidelines,and Uniform Acts. The Bluebook now requires the name of the institutional author in the parenthetical with the year of adoption. Rule 12.9.5 covers citation of the ABA Code of Professional Responsibility and Opinions on Ethics.The institutional author is required in citations to the code. Use table T6 (case names and institutional authors) for proper abbreviations when citing these documents. For in-text citation of model rules and codes, consult Rule B12.1.3. To cite case law, consult Rule 10, Rule B4, and tables T1 (jurisdiction), T6 (case names), T7 (court names), T8 (eplanatory phrases), T10 (geographical terms), and others if neccessary. To cite statutes, federal or state, consult Rule 12, Rule B5, and tables T1 (jurisdiction), T9 (legislative documents), T10 (geographical terms), and others when neccessary. To cite administrative rules and regulations, consult Rule 14, Rule B5, and tables T1 (jurisdiction), T9 (legislative documents), T10 (geographical terms), and others when neccessary. 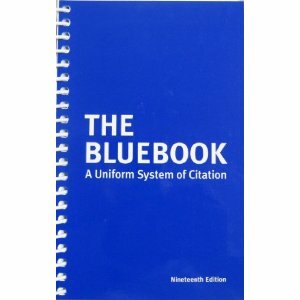 The Bluebook: A Uniform System of Citation (KF245 .B58) is the definitive style guide for legal citation. When writing, consult the Bluebook for proper form of legal citation. The most recent edition is the 20th. Also keep in mind that the point of citation is not to memorize all the rules within The Bluebook but to know how to use it and how to find the applicable rules. The world of online information is vast. Many materials are available freely on the Internet, but their citation can be intricate. There is a need for permanent, authenticated, and authoritative sources. Print resources meet these criteria, which is why The Bluebook requires and prefers their citation whenever possible. If you do have to cite to an online source, consult Rule 18. "The Bluebook requires the use and citation of traditional printed sources when available, unless there is a digital copy of the source available that is authenticated, official, or an exact copy of the printed sources, as described in rule 18.2.1." Rule 18.2.3: Even when a source is available in a traditional printed medium, a parallel citation to an Internet source with identical content may be provided if it will substantially improve access to the source cited." It is important to cite permanent sources; online sources may suffer from the phenomenon of link rot. "Link rot (or linkrot) is the process by which links on a website gradually become irrelevant or broken as time goes on, because websites that they link to disappear, change their content, or move to new locations." [Wikipedia] To attempt to retrieve a broken link, please consult the Internet Archive under Electronic Sources in this guide.